Baby Decks DJ, the world's first Twin DJ Turntable for iPad is here! Important: Naturally, Baby Decks supports iOS6's Multi-Route Audio feature (a.k.a. Headphone cueing). This is a game changer for iPad DJing. Read all about it in the manual. 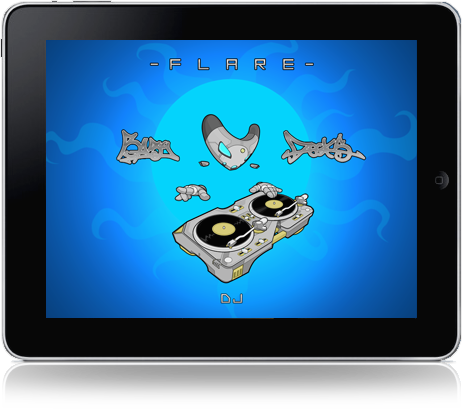 In 2010 the world of digital turntablism was revolutionised by Baby Decks, the world's first dual turntable app for iPad. Baby Decks is a fully portable DJ rig. Whether your style is scratching or mixing, Baby Decks caters for both, offering a wide range of customisable options to fully enhance your DJ experience. Featuring the unique, smooth, aged-in-an-oak-barrel scratch algorithm made famous by Baby Scratch and Flare Scratch, Baby Decks is the answer to all your mobile DJing needs. With a long list of features including cross fader, pitch adjust, transformer buttons, track upload and more, Baby Decks will have you scratching at home all day, or rocking the party all night. New: Baby Decks now supports the Numark iDJ Live Controller making it not only the most responsive digital turntable out there, but also the most tactile. Now also available for Mac OS X.
Flare is where it all started! Check it out!